At the recent Annual Spring Conference 2019, the College hosted a prizegiving ceremony on Friday 5th April, where the winners of the John Dunne Medal, Ada English Medal and Best Poster Prize were announced. 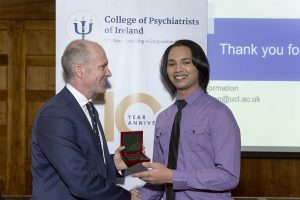 The John Dunne Medal is awarded for outstanding trainee contribution to psychiatric research. 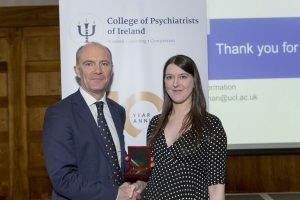 Dr Laura Bond was awarded this year’s medal for her paper entitled ‘What happens to adolescents in the private mental health sector when they reach 18: a study of transitions from adolescent to adult services? (2018). Established in 1989 to honour Prof John Dunne first Professor of Psychiatry in Ireland and President of the Royal Medico-Psychological Association in 1955, the prize acknowledges original and outstanding contributions to the field of psychiatric research. The prize is open to all trainees from Ireland, Northern Ireland and Britain. To be eligible, a trainee much have made a significant contribution to an original paper published by the Journal over the year. The Ada English Medal was established in 2017 in honour of Dr. Ada English, one of Ireland’s pioneering psychiatrists in the early twentieth century, and an innovator in the field of mental health. 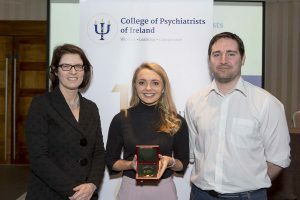 The Ada English medal is awarded annually to a medical student from all countries who has published original scientific research in the Irish Journal of Psychological Medicine. The CPsychI poster exhibition was on display at the conference venue over the two days. The Best Poster Prize was awarded to the winner of the poster presentation competition, Dr Kiran Santal for his poster entitled ‘Treatment of GHB withdrawl in the G Dexotification in the HSE-National Drug Treatment Centre: An update on service provision and patient outcomes’, co-produced by DR Kiran Santal, Dr Peter McCarron, Dr Eamon Keenan, Dr Fiona Fenton. Congratulations to this year’s winners and thank you to everyone who participated.